We’d love your help. Let us know what’s wrong with this preview of Doomsday Deck by Diana G. Gallagher. The gang have been preparing for the Sunnydale Sidewalk Art and Craft Festival. It sees the arrival of Justine, who specialises in Tarot paintings and Buffy has a nagging suspicion that Justine is not all she seems. Then one by one, the gang start to surrender their free will to some unseen force. To ask other readers questions about Doomsday Deck, please sign up. Best Buffy The Vampire Slayer Books. These books are fun, kind of like reading an episode instead of watching one. 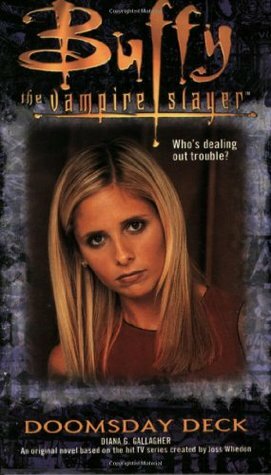 This time Buffy must battle an evil tarot deck threatening to take over her friends and perhaps the universe. Can Tarot really end the world?! Buffy has to wind up saving all her friends and the entire Universe from an Evil Goddess named Kali who possesses a young artist named Justine who does Tarot readings and when she does them the Deck of cards empowers the person's mind and puts their Essences and Emotional thoughts and makes them trapped in a Tarot painting. The goal for the Tarot paintings is to speed up the process of ending the Universe. If Justine can do that, then the world will end and she will get what she wants. Can Buffy stop her? Or will her friends and her wind up trapped in the world of Tarot forever? This was a fun entry in the Buffy books series. I won't be spoiling anything by letting you know that the title, Doomsday Deck" comes from the fact that the story centers on Tarrot cards.The author has captured the "regulars" well, and the story moves along at a good pace. If you're a BTVS fan,then I'm sure you'll enjoy this particular book. The TV show is long gone (unless you have Netflix),so at least the fans will have the novels to read! Another good novel based on the characters we know and love. I loved the story - although I think I might be avoiding my Tarot deck for a while - not that I'd ever want to use them to bring about the end of the world - well, not at the moment anyway! I really enjoyed it and it brightened up a couple of otherwise dull dinner breaks. This book is more of a short story than novel. That being said, it is a good short story that takes place in the Buffyverse. The author did an excellent job portraying the characters of the tv show. I had no problems with this book and I could have pictured this being an episode of the show. If you like Buffy, read this short story. Pretty goddamn terrible Buffy book! Buffy's stand out feature was always the truly wonderful dialogue and if you can't replicate it, you shouldn't even attempt a book. And what's with that ending?! A real let down. Another two thumbs up for the great Buffyverse. Fantastic book as per usual I loved every minute of it. Recommended to Katherine by: Mom got it @ a library booksale just b/c she thought of me when she saw it... not b/c she thoguht it would be a good book! Entertaining enough to kill a couple hours on a 10 hour car trip. Really, what can one expect from a book based on a TV series? Diana G. Gallagher is an American author who writes books for children and young adults based on television series. She has contributed to book series based on Buffy the Vampire Slayer, Sabrina the Teenage Witch and Charmed, among others. Born in 1946, in Paterson, New Jersey, she now lives in Florida with her husband, the writer Martin Burke. She sometimes also writes under the name Diana Burke. Ga Diana G. Gallagher is an American author who writes books for children and young adults based on television series. She has contributed to book series based on Buffy the Vampire Slayer, Sabrina the Teenage Witch and Charmed, among others. Gallagher won a Hugo Award for Best Fan Artist in 1988 under the name Diana Gallagher Wu.